The main limit of electric field in gene therapy is due to is lack in efficiency compared to viral vectors. Our challenge is to improve gene expression. Our objective is to increase DNA uptake into the nucleus. 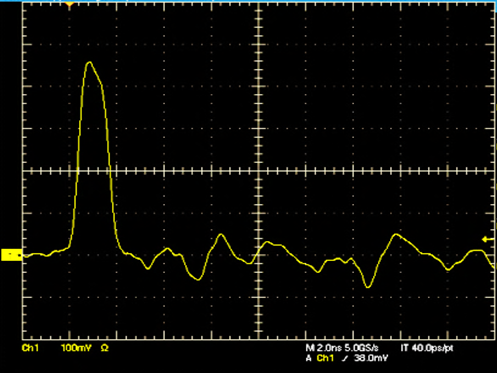 For that, new generation of pulses generators able to deliver pulses with opposite direction and nanopulses generators delivering very high voltage at the nanosecond time range will be used and adapted. By doing so, we will be able to define electric field conditions allowing the best electrophoretically-mediated access of molecules in the core of the spheroids and tissues (pulse intensity, pulse duration, pulse polarities) to preserve cell viability while ensuring highest molecule uptake. Nuclear transfer of plasmid DNA once electrotransferred into the cell cytoplasm will be increased by applying nanosecond pulses at a precise time following electropermeabilization. Pulsation chambers are designed to be adapted to each model (GUVs, cell, spheroid and tissues in mice) to allow direct visualization of the electropermeabilization processes. We are using advantage of Atomic Force Microscopy to directly visualize the consequences of electropermeabilization in terms of membrane reorganization and to locally measure the membrane elasticity. Our results obtained both on fixed and living CHO cells give evidence for the first time of a rapid propagation of membrane perturbation along the entire cell surface. We visualized transient rippling of membrane surface and measured a decrease in membrane elasticity by 40%. Thus, AFM appears a useful tool to investigate basic process of electroporation on living cells absence of any staining or cell preparation. Pictures of cells observed by AFM. Optical imaging of small animals allows observation of kinetic fluorescent events in time and space on the scale of a whole body, an organ or a cell. It enables detection and quantification of the in vivo expression of GFP (Ds-Red or Hc-Red) used to monitor gene expression, gene regulation, tumor growth and metastasis on a scale of days or weeks. Autofluorescence considerably limits sensitivity in vivo and the most efficient spectral range for fluorescence detection is between 600 and 900 nm. Therefore it is important to use fluorescent dye emitting in the far red such as Cy5, Cy5.5. 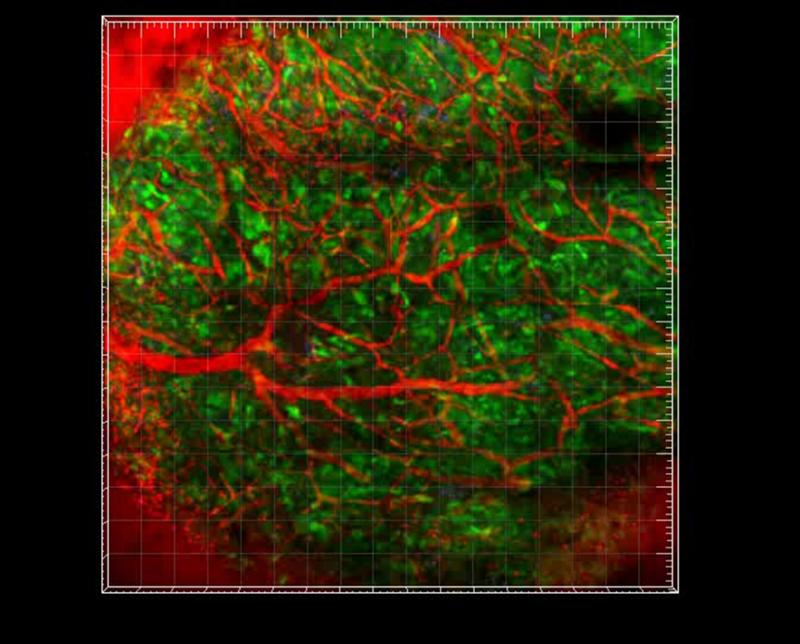 As far as visible emitting fluorescent dye are used (reporter proteins), multispectral imaging and image processing is employed in order to reduce artifacts and background signal due to tissue autofluorescence. This imaging technology is not invasive, the comfort of animals is preserved. 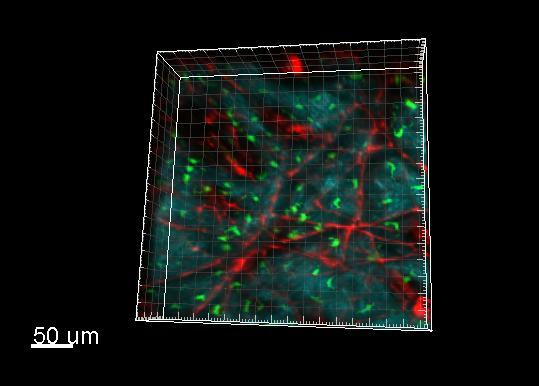 Visualization in vivo by multispectral imaging of eGFP-B16F10 cells. If Multispectral Imaging is not sensitive enough, we adopted the use of intravital microscopy that is the implantation of a window chamber or dorsal skinfold chamber on the back of the mice. This is a project supported by the company Pierre Fabre dermatology. The aim is to characterize the dynamic of the dendritic cells in the skin in response to atopic dermatitis. In these pictures, epidermal dendritic cells expressing the green fluorescent protein (Lang-eGFP) are visualized in green . The autofluorescence of the stratum corneum (SC) is visualized in red. The blue signal comes from the second harmonic reflection of the collagen within the dermis. The aim of this study is to visualize at the vessel level, the modifications induced by electropulsation on the blood vessels permeability, and at the cellular level, on the changes in endothelial cells organization in the venules. 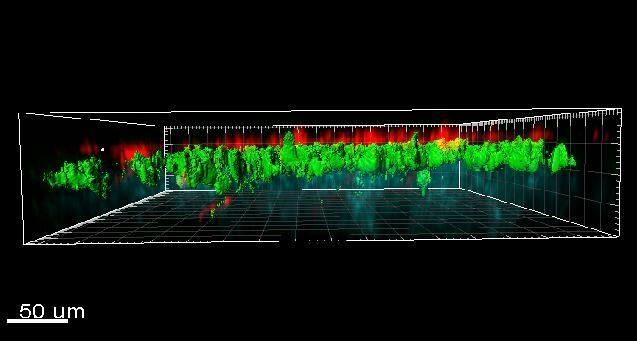 3D visualization of tumor (eGFP-B16-F10) vessels highlighted by intravenous injection of Rhodamin-Dextran. Over the last decade, electropermeabilization has given rise to a cancer treatment modality, electrochemotherapy that combines conventional chemotherapeutic agents with electric fields . Electrochemotherapy is highly effective and is now accepted in a number of countries as a palliative treatment in Humans. In addition, electrotransfer can also be used to deliver a wide range of potentially therapeutic agents including proteins, RNA and DNA. Clinical trials of gene transfer by electric fields are still under development. Combination of ECT and EGT for sarcoid treatment. Sarcoids represent one of the main skin cancer in horses. Relapses are often present. New treatments are necessary to eradicate them. Our team has been collaborating for more than 9 years with the veterinary school in Toulouse to treat sarcoids by electrochemotherapy. The results we obtained are encouraging as more than 95% of the treated tumors are in complete regression (Tamzali et al., Equine Vet J. 2012). However, electrochemotherapy has no effect on untreated tumors. In order to eradicate all the tumors, we are now developing a new approach based on the combination of electrochemotherapy and electrogenetherapy by expressing plasmid coding IL-12 to stimulate the immune system response. This project received a prize from the Région Midi-Pyrénées Laboratory Research category in 2005.